Random House Trade Paperbacks, 9780812984842, 384pp. In the fall of 1941, the Philippines was a gardenia-scented paradise for the American Army and Navy nurses stationed there. War was a distant rumor, life a routine of easy shifts and dinners under the stars. On December 8 all that changed, as Japanese bombs began raining down on American bases in Luzon, and this paradise became a fiery hell. 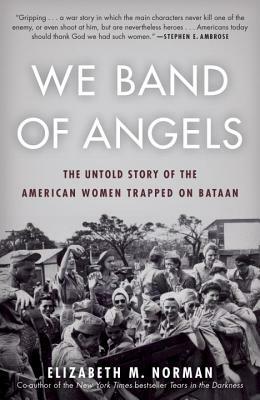 Caught in the raging battle, the nurses set up field hospitals in the jungles of Bataan and the tunnels of Corregidor, where they tended to the most devastating injuries of war, and suffered the terrors of shells and shrapnel. But the worst was yet to come. After Bataan and Corregidor fell, the nurses were herded into internment camps where they would endure three years of fear, brutality, and starvation. Once liberated, they returned to an America that at first celebrated them, but later refused to honor their leaders with the medals they clearly deserved. Here, in letters, diaries, and riveting firsthand accounts, is the story of what really happened during those dark days, woven together in a deeply affecting saga of women in war. Elizabeth M. Norman, R.N., Ph.D., is a professor at New York University’s Steinhardt School of Culture, Education, and Human Development. She is the author of Women at War: The Story of Fifty Military Nurses Who Served in Vietnam, and co-author with Michael Norman of Tears in the Darkness: The Story of the Bataan Death March and Its Aftermath, which made The New York Times list of top ten nonfiction books in 2009 and was named a 2010 Dayton Literary Peace Prize finalist. Her awards include an official commendation for Military Nursing Research from the U.S. Department of the Army.